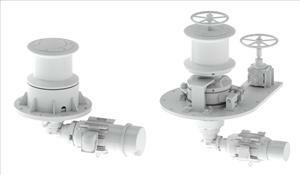 The windlass was designed to ABS standards for a minimum design temperature of -25F°. Testing and certification was witnessed by ABS in our St. Louis facility. The Thru-Deck Capstan features a Variable Frequency Drive (VFD) control package, a right angle drive gearbox, 20 HP marine duty motor and 18" diameter barrel. Both control packages feature Nema 4 stainless steel enclosures.